A little change from the norm for today's blog because I just had to share these red suede boots that granny bought the twins for their birthday. So back to the boots - they are fleece lined right down to the toes and are a perfect fit for my wide footed girls (G/H) and for the first time in a long time, both twins love them and are happy to wear them. I'm realising as time goes on that little girls are rather opinionated about what they wear <sigh>. And no smart comments about apples falling from trees, ladies!! Boys are seriously so much easier to dress. Before I go - last few hours left to enter my handbag & candles Christmas competition. Click here to enter. I'll be drawing the winner later this evening and announcing in the morning! Good luck and thank you to everyone who's entered so far. She is sooo cute! Love her hat! Awww - such a cute and funny post! Your little one looks adorable though I'm sure you've got your work cut out and the bonus is at least you have a photographer in the house unlike me. For your info - my top score on Bop- is 15. How pants is that? Very cute! 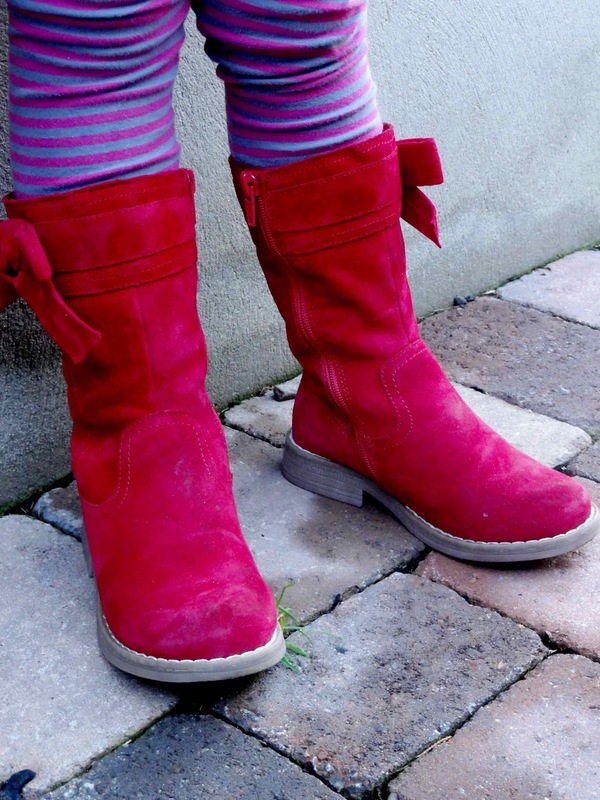 Poppy has some red suede boots too - they are surprisingly easy to keep clean! Poor little thing. She looks adorable and the boots are super cute! So is this the little one that is going to take over your fashion empire when you retire!!! Aw what a wee cutie even when ill, the wee boots are gorgeous. I'll have to second it not just being a girl thing being fussy about clothes, my 17mo old is fussy already especially with shoes! What a cutie. I love those boots - wish they made them in my size. Boys are easier to dress until the age of 12 and then its the hair and the exercise routine to hone the abs. Watch Out. They can be just as high maintenance as girls.